EXPERIMENTAL LIVING INSIDE A DUTCH GREENHOUSE. What is the greenhouse project . 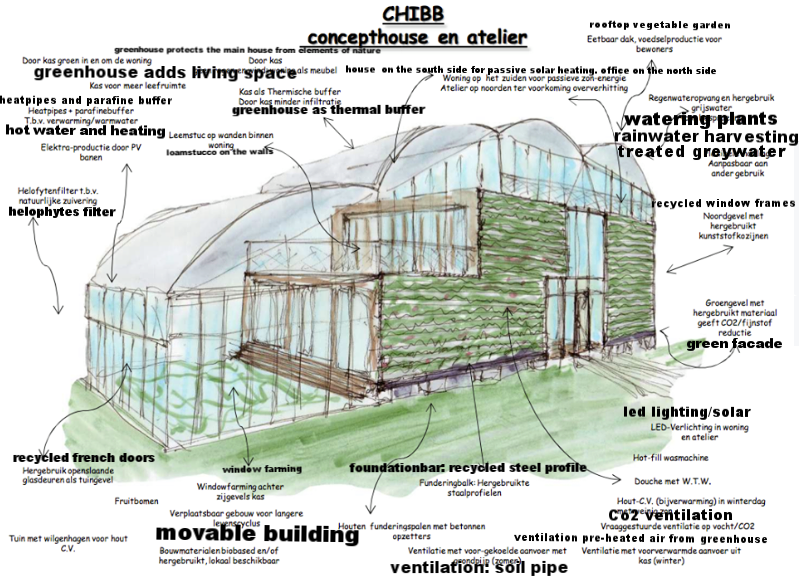 For a temporary experiment on sustainable building technologie me and my family function as a test family and moved into a higly sustainableeco-bio greenhouse. SITUATED IN ROTTERDAM THE NETHERLANDS. Build and designed by students of the shool for sustainable building technologie. the studenst wanted TO see to WHAT EXTENT A HOME COULD DOUBLE AS A PLACE TO GROW FOOD FOR IT'S INHABITANTS, AS WELL AS PROVIDE INEXPENSIVE HEATING AND COOLING.THEIR SOLUTION? ENCASE A WOODEN DWELLING IN A GREENHOUSE. As a interior decorateur The opportunity to furnish a house like this was to good to pass on. the fact that it had to be done with natural & recycled materials was an extra bonus. To top that we would have to grow our own food on the rooftop. (Need I say more?) While growing up as a kid we moved around a lot. every new home would make me feel different. That gave me an profound interest in homes, interiors and the accommodating lifestyle that houses require. this awareness when ever I walk into a house or building has never left me and later became my PROFESSIOn. The psychological aspect of houses. my love for the use of natural materials. the dislike of most of the new concrete houses/flats being build today. The question why do we pay so much for a house that in real cost so little to make?? The realisation that only 20% of the world population lives in houses with utility systems. 80% lives without. All of the above triggerd me to want to learn more about going off gridd, experimental houses and their accommodating lifestyle.. Going back to shool was not an option. so I set off to build an simple off the gridd house ( earthship). permit isseus led us to PROFESSOR Karssenberg who had just finished building his first experimental house with the students of sustainable building technologie. he mentioned being on the lookout for a test family to live here. I APPLIED on the spot. in one sentence we moved here to learn!!. LET US LEARN FROM WHAT WE BUILD. AND SHARE WHAT WE LEARN IN ORDER TO MAKE A BETTER WORLD. The house was build with al natural & recycled materials. wood was used for the walls, floors and ceilings of the iinterior house and greenhouse structure. We knew upp front that we can only stay here for 3 years. We decided there are no guarantees in life. We Sold our old town house. got rid of almost everything we owned and moved in here. The house was buiild for research purpose. being able to relocate the house is part of the experiment. The STUDENTS were able to bypass laws and restrictions because of the temporary aspect and the fact That this structure does not require a foundation that goes into the (polluted)ground to uphold the house. For us the test-family the temporary aspect is a bonus. The house is not al that convenient. winters are cold and summers are blistering hot. The idea that it is only temporary HAS helpED US overcome SOME OF those inconveniences. It get's pretty technical when I try to explain al of this and it took me a year and a half to figure out what went wrong here. And how to deal with it. And we are still not there yet. During spring and autumn the house feels like a tropical holiday. on a sunny day THE air in the GREENHOUSE HEATS UP TO such AN EXTEND THAT we warm up the house By simply OPEning AL THE DOORS to the southside greenhouse. No extra heating is needed. even when it rains or there is a storm is is spectaculair to sit in the greenhouse and watch nature take its course. during summer when the sun finally does show her face it get's blistering hot in here. The biggest problem is on the south side of the house on the terrace. where we have our kitchen. The temp is always about 15 degrees celcius warmer that it is outside. That's al nice when it is cold outside but when it gets hot it gets so hot that it is it's not duable anymore. the sunlight becomes blinding Even the leafs on the few remaining plants* get bleached. So we need to create a shadow over the intire tilted angled window. The shadow has to be on the outside. we learned that the hard way. It was a visitor that explained to me: that the windows of the houses in mediterranean country's have blinds on the outside of the house for this reason. ( I never even thought of that having a reason). During winter it get's way to cold. we can't seem to heat up the place. we have a 100 solar thermal collectors to heat our water. the water is then stored in a buffer tank and run's trough the heaters. the idea was that we would only have to use the woodstove for 2 weeks a year. It failed in al categories. We now have a pallet stove that burns 24 hours a day from sept until march it is an improvement but not a hugh one. The students are still planning to look into it with no succes so far. The first winter we seriously considered it was not worth staying. we froze. But stayed anyway. We cooked out on the terrace with our winter coats on. ( we did that last winter to( feels a bit like being on an extended winter camp. Non of the doors close properly we don't know if that is because students buiild the house, the materials used or the design of the house. But we do know that the wind comes in and out as she se pleases. So warming up the air with a normal heating system is useles. We would need ( figured this out after some one finally was able to explain how it al works and told me where to read more on this topic). We would need a ceramic heater like they use in Sweden, zwitserland and canada. When designing the house the students calculated that inside the greenhouses ( rooftop and southside are separated) it would not freeze. They were wrong. it did. And killed most of the tropical plants. After being in contact with the farmers tha grow their crops in greenhouses they learned that you need to put up a blanket 10 cm from the glaswindow. It wil create a warmth insolation an keep out the frost. unfortunately we learned this after the house was build and the funds were dryed up. But do keep this in mind wehen you want to build a greenhouse to live in. Do you have any advice you would like to share on this topic or a heating/ cooling system you would like me to try please do get in touch. we need al the help we can get on this.. There are many different areas in the greenhouse where we are growing plants. Some areas work better than others and some do not work at all. The greenhouse on the southside is design with a constant flow of air going through.but plants can't stand the draft on ground level we even had to take everything out that we had planted. nothing survived here. On the terrace it is the same. But here the catus, the fig and the grapes are doing ok. But we have to bring them in or put on extra protection during winter when it starts to freeze. in the patio the draft and freezing temperatures are causing the same problem. But the Grapes love it here. And are growing in abundance. the rooftop garden. now that is a story al to itself. .
it is amazingly beautiful but unfortunately unpractical. Up on the roof the heat (summer) and the frost (winter) are taking it's tol. The biggest issieu is water. The original design was set to harvest the rainwater on the roof in barrels. Due to extreme temperature differences the rubber hoses that connect these barrels often break or just start leaking. when that happens the water runs strait trough the wooden floors onto the loamstucco walls which then dissolves. ( like pouring water over a sandcastle)The rainwater in these barrels get's easily contaminated due to the heat. We learned that rainwater should always be stored under the ground and pumped up to the roof. The big garden-beds weigh a lot and could only be placed near the windows. making them only accessable on one side. (not convenient) the windows can't be cleaned ( also not convenient). The soil in the garden-beds have to be renewed every 3 years. And that is Not a fun job taking 6000 litrs of soil out an carry it down stairs and then put in new soil. And more over you can't grow enough food in these gardenbeds to feed a family and you can't grow a huge variete up here. Latuce for instance doesn't stand the heat or the draft. Without a proper watersprinkler system the grops dye every time we go on a HOLIDAY. Watering the plants is a difficult thing to ask of friends and house sitters who have not been taking care of the plants as INTENSELY as I do. My conclusion: a greenhouse on your rooftop it is being done al over the world people are even raving about it. But I HONESTLY wonder if everybody is being honest about how that is working. Bu I would really like to hear and see for myself if there are any rooftop greenhouses with a more scientific APPROACH that are working..
we moved here to learned from the house but i learned the most from all the people that have come to visit us. knowledge is such a powerful thing. There is a lot being shared on the internet but having a conversation with someone ( a complete stranger)in person who simple knows everything about a topic has such a huge impact. And I am not a technical person when just moved here I had to look up most words the PROFESSOR/architect* was using I simply did not have a qlue what he was going on about when he gave a tour around the house. but i sure do now. The dutch climate Is very wet, damp and cold. therefore we spend about 90% of our time indoors. having acces to natural daylight in an indoor/outdoor garden added to your home is a huge bonus. It MAGICALLY liftes your mood. Living in a house surrounded by loam stucco walls and wooden floors and ceiling is a joy. Feels like being on a tropical holiday. the tropical fruit trees probably have something to do with that to. It's a female thing to notice but our skin cleared up 2 weeks after we moved in. And it stayed that way. That has to do with the stucco loam. It attracts al the dust that normally wanders around the house. So if you are asthmatic loam stucco will help you for sure. If it is doing so much for your skin it must do something with the mind to. sleeping in a hammock in the greenhouse under the stars works like a magnet for kids (and some adults). You wake up feeling more energized that normal. ASIDE FROM A LITTLE BACKPAIN FROM lying THE HAMMOCk. plants and draft do not go together. when the sky is clear and it is freezing outside it wil freeze even harder inside a greenhouse. when you put a greenhouse over the south side of your house do not go above ground level. The earth is the only mass that can really deal with heat. When you need more info on this topic please contact me. I wil explain in person. we have no idea yet. But I have my focuse on floating. Thank you for joining the greenhouse newsletter. We will keep you posted when there is news or an upcoming event at the Greenhouse.